Washington, D.C. — The U.S. Department of Transportation (DOT) announced the list of 41 recipients of nearly $500 million in discretionary grant funding for road, transit, maritime and rail projects through the Transportation Investment Generating Economic Recovery (TIGER) program. More than 64 percent of this round of TIGER funding was awarded to rural projects, a historic number that demonstrates this Administration’s commitment to supporting the country’s rural communities. Tribal projects are receiving $39.18 million of this round of awards, the highest amount of funding since the first round of TIGER. The primary selection criteria for TIGER awards include considerations for safety, state of good repair, economic competitiveness, quality of life and environmental sustainability for each project. Secondary criteria include innovation and partnerships. The criteria used to select projects for these grants were similar to the Administration’s Infrastructure principles of supporting economic vitality and promoting innovation. 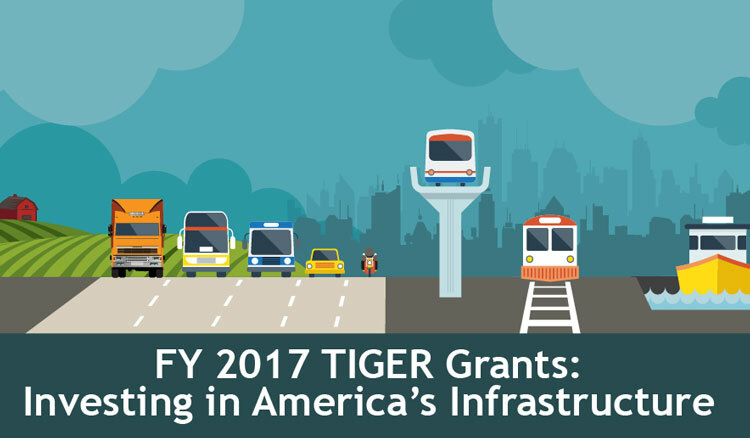 The fiscal year (FY) 2017 TIGER program gave special consideration to projects which emphasized improved access to reliable, safe, and affordable transportation for communities in rural areas, such as projects that improve infrastructure condition, address public health and safety, promote regional connectivity, or facilitate economic growth or competitiveness. The projects supported by the TIGER discretionary grants are listed at https://www.transportation.gov/tiger.